Kale and other green leafy vegetables. Kale is arguably the #1 most nutrient dense food. That means it provides more vitamins, minerals and other phytonutrients (such as anti-oxidants) per calorie than any other common food. All leafy green vegetables are rich in carotenoids, especially lutein and zeaxathin. Lutein, for example, is recommended for glaucoma, cataracts and just about any issue related to eye health. 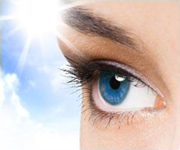 Lutein and zeaxathinfound are both found in high concentrations in healthy eyes. These two nutrients are important for protecting your eyes against everyday insults such as ultraviolet light and chemical free radicals. Garlic and onions. Garlic and onions are rich in sulfur, which is necessary for the production of glutathione, an important antioxidant for the eye -- and the entire body. Garlic can reduce cholesterol and improve circulation. Optimal blood flow in the tiny blood vessels of the eye is very important for good vision. Grains, nuts and seeds. These foods are some of the most complete and nutrient-rich foods you can eat. They are some of nature's most concentrated food sources. They contain essential fatty acids (such as the omega-3 EFA's) which are important for good vision, among other things. Do not skip these foods because they contain fat -- they contain good fats that are essential to health and vision. They are also nature's best source of the B-vitamins. Deficiencies of the B-vitamins cause many different vision problems. Vitamin E is another nutrient that is important for fit eyes and grains, nuts and seeds are top sources of the full Vitamin E complex. Beware that taking common Vitamin E supplements does not provide this full Vitamin E complex -- and that can lead to a host of problems. Food is your best medicine and grains, nuts and seeds are great foods. By the way, if you don't eat enough nuts and seeds, you will need to supplement your diet with cold pressed vegetable oils to get enough essential fatty acids. One way or another, you have to have enough of the good fats in your diet, so get it from the foods that provide the best "bang for the buck." Beans and legumes. Many beans and legumes are rich in important nutrients for vision. Take lentils for example. Lentils contain significant amounts of magnesium. Many patients with eye diseases (such as glaucoma) have found that supplementing with magnesium is important for their vision. Magnesium can help relax the veins and arteries, which lessens resistance and improves the flow of blood, oxygen and nutrients in the eyes (and the entire body). Of special note to glaucoma patients, thanks to Allan Tillotson, certain chemicals found in beans "have been shown to [lower eye pressure by] relaxing the trabecular meshwork without tightening the ciliary muscle. ... These [eye pressure reducing] substances are found in high amounts in beans, including yellow split pea, black turtle beans, baby lima beans, large lima beans, anasazi beans, red kidney beans, red lentils, soybeans, black eyed peas, pinto beans, mung beans, azuki beans, etc." Fruits and vegetables. Fruits and vegetables contain a multitude of vital nutrients. For example, the yellow vegetables, such as carrots and squash, contain carotenoids that are important for vision. Foods like apples, broccoli and yellow onions contain quercetin. Not only is quercetin one of the most important and most active bioflavonoids (which are important for the eyes), quercetin is also a tyrosine kinase inhibitor which is one of the chemicals mentioned above that can lower the pressure inside the eye. Blueberries, grapes and raisins. According to Dr. Abel, these foods contain anthocyanins, which improve night vision. A cup full of blueberries, huckleberry jam, or a 100 mg bilberry supplement should improve dark adaptation within 30 minutes. Cod Liver Oil. Cod liver oil is a rich source of omega-3 essential fatty acids, including DHA. DHA is known to be very important for the eyes and the brain. It is thought to lower eye pressure in glaucoma and it is an essential part of the cells in the retina. Although plant sources of omega-3 essential fatty acids are excellent, I recommend that even vegetarians consider cod liver oil because, unlike plant foods, it contains ready-made DHA which many people need to consume in their diet for maximum health and optimal vision. Cod liver oil has a long tradition of use and I prefer it over most commercially available fish oil supplements. Ghee. Ghee is a type of oil derived from butter. However, it is not butter. The only study I know of that looked at ghee's effect on blood cholesterol found that ghee lowers bad cholesterol. Ghee is said to be very good for the brain and nerves, including the optic nerve. For vegetarians, ghee is an important source of vitamins B-12, A and D. The traditional medical system of India, Ayurveda, recommends supplementing their predominantly plant-based diet with ghee because those particular vitamins are often deficient in pure vegan diets. Ayurveda also recommends a warm ghee bath (netra basti) for the eyes. It is very soothing and nourishing for the eyes. Ghee is also good for the joints and many other parts of the body. Plus ghee tastes great. When you cook with it, don't heat it over about 325 degrees F.
Cold water fish (sardines, cod, mackerel, tuna.) Cold water fish are an excellent source of DHA. However, this food is not on my list because it can be difficult to get fish that is both fresh and pollution free. According to Dr. Fuhrman, "Fish and fish oils have been shown to contain large concentrations of fat soluble petrochemicals, such as PCB's and dioxins as a result of the dumping of toxic waste and raw sewage into our oceans. Fish and fish oils also contain mercury. According to the Center for Disease Control, 1 in 12 women of childbearing age in the United States have unsafe mercury levels (and the CDC's threshold for safety is high). The major contributor to mercury build-up in the body is fish and fish oils, not dental fillings. Multiple studies have illustrated most of the body's mercury load comes from the consumption of fish." Shark, swordfish, mackerel, pike, tuna, snapper, lobster, grouper, sea bass and bluefish are known to be particularly high in mercury. Cod from the Norwegian coast is said to be relatively pollution free. Spinach. Spinach is a popular food, but I don't rank it as high as kale. Spinach should probably not be eaten raw either. Eggs. Eggs are rich in cysteine, sulfur, lecithin, amino acids and lutein. Eggs aren't one of my top foods, but if you do decide to eat eggs, make sure you get eggs from healthy free-range chickens. Soy. Soy is a bit controversial. Most of the soy we consume is very processed. However, even edame (the whole bean, salted) is not a sure bet for good health. However, fermented soy, such as real tempe, is a much better bet. Soy is low in fat and rich in protein, but soy has become over-consumed and consumed in the wrong forms. With all the potential issues, soy can't be a top food recommendation. It might be OK in moderation and in the right form, but that's about the strongest recommendation I can make. Wine. Wine is sometimes recommended, but most or all the benefits of wine can be obtained by consuming grapes, raisins or grape juice - without the issues associated with alcohol. By all means, if you want to consume wine in moderation for social reasons (or for medical reasons as recommended by a health care professional), go ahead. Just don't think that wine is a special food that belongs in the list of the healthiest foods for vision. You can get all the benefits without the drawbacks from other grape products.